File Shark is a free Windows 8 Duplicate File Finder and Bulk File Renamer app that lets you find and remove duplicate files from you Windows 8 system and rename multiple files in one go. You can also find and move duplicate files to a desired folder, if you want. 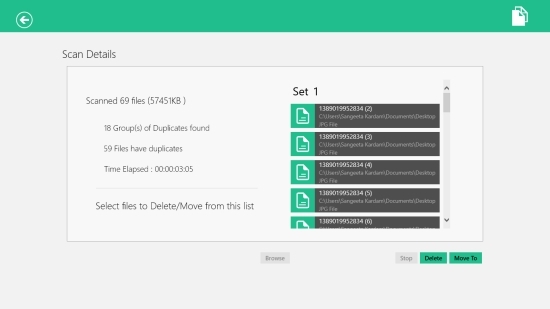 This app scans all the files in a given folder, takes out the duplicate ones, and group similar files together, which can then be moved or deleted. In the second function of the app, you can mark files in a folder or select all files to rename them in one go. The app also enables you to select file extension while renaming files. It supports various common document, image, and audio file formats. So, you can select a specific file extension to rename a particular type of files in a folder. You will also find a Help page that demonstrates how the file renamer of the app works. File Shark is freely available in Productivity category of Windows Store. You can view the app directly in Windows Store by clicking on the link given below at the end. To use this free Windows 8 app to find, move or remove duplicate files, and rename bulk files, first install this app on your Windows 8 PC. The Start screen looks quite clean with two options: Duplicate Finder, Bulk Rename. Click on Duplicate Finder option. You will see browse screen to select a folder from which you want to find duplicate files. Click on Browse to select the desired folder and press OK. The app will quickly scan all files in the selected folder and display the list of duplicate files by grouping similar files together. Below the scan details, you will see Delete and Move options. 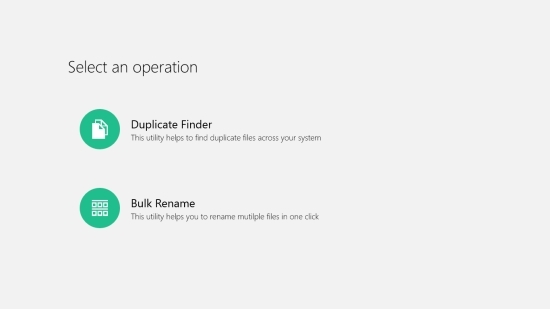 Using these options, you can either delete all identified duplicates from your system or move duplicates to a separate folder on your system. Click on Bulk Rename option on the Start screen of the app. You will see browse screen to select the desired files that have to be renamed. On the browse screen, options Edit File Name, Select Extension, Browse, and Select All will be placed. You will also see Rename option here, which will initially be inactive till you select files to be renamed. As you select the desired folder, all the listed files in that folder will get displayed on the next screen. A right flyout will appear with renaming options. The app offers a wide range renaming options. You can remove the entire name, remove or replace characters, remove periods with spaces, or include indexing. You can select files manually or click on Select All to select all the files in the specified folder and rename them. In case a folder contains different types of files, you can select a particular type of file using the Select Extension dropdown. Also try: Remove Dups, Simple Photo Converter. File Shark is a very efficient tool to find and move/ remove duplicate files from your system. You can also rename bulk files easily. The operations of the app are pretty smooth and you get two useful functions in a single app. Try this app and share your feedback via comments. Great! I also know another tool which is very usefull in cases like this, DuplicateFilesDeleter. Thanks!